Design Thinking is a creative problem solving method and mindset. It’s human-centered, iterative, and collaborative. By using empathetic research techniques, creative brainstorming skills, and rapid prototyping techniques, design thinking leads to more interesting and effective ideas. It’s also pretty fun! The Design Gym believes in interactive practice-based learning over theory. Getting your hands dirty is the fastest way to develop creative muscles! 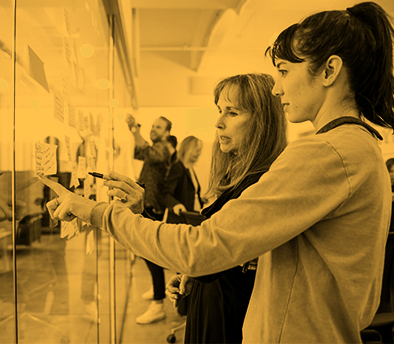 We’ve created a learning environment where you can practice your new skills on a project challenge while being coached by practitioners from the fields of design and innovation.